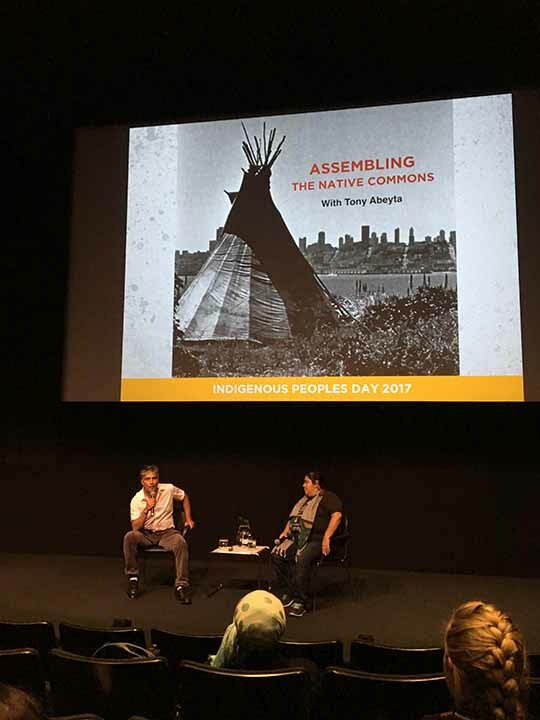 Tony Abeyta and Corrina Gould’s presentation had a special connotation as it was held during Indigenous People’s day. While many parts of the country celebrate Columbus Day, Berkeley was actually the first city to, alternatively, establish Indigenous People’s Day, challenging the idea that Christopher Columbus “discovered” America. Although there is an effort towards the recognition of these debates, this is only one step towards change. And that resonates on the importance of the works of people such as Abeyta and Gould. Corrina Gould started the conversation sharing with the audience some of her work as an activist protecting Ohlone Heritage in the Bay Area. “People move into the East Bay and rarely think about the history behind the land that they are now occupying”, Gould said, while introducing the Emeryville Shellmound case: this great sacred burial site with secular meaning for the Ohlone people that today only survives as a small piece of land considered to be a memorial at the entrance to a shopping development. 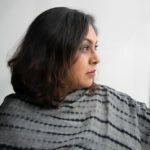 Gould raised the question of what is considered sacred and to whom, and emphasized that there is an important aspect in understanding that part of being sacred is about knowing what that space is and where you are at. There is a need for people to learn how to behave as a guest on someone else’s land. It is also interesting to remember the symbolic significance of land itself. What is the land’s responsibility to us? What is the reciprocity? By sharing the land one creates these relationships. Gould reminds us that when we talk about gentrification today we talk about all people being removed from their area, as if it was the first time this happened. Genocide, she concludes, is not only about killing people, but about making them invisible. 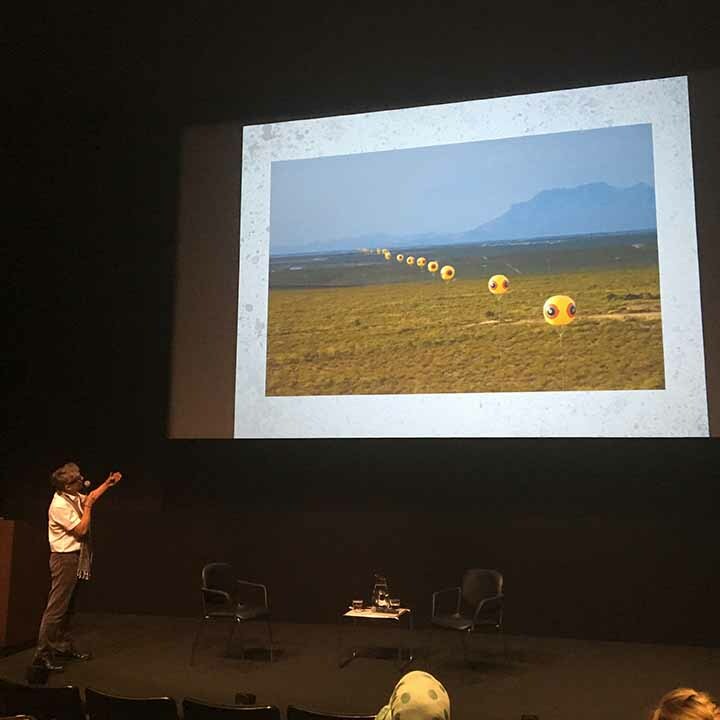 Tony Abeyta opens up the discussion on land and the sacred showing some examples of responses contemporary Native American art is exposing to a larger public today. 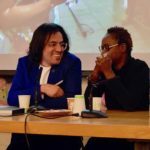 From actions at the North Dakota Pipeline, to smashing stereotypes through sculpture and performance. 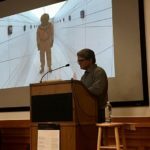 Amongst other pieces, Abeyta shared with the audience the works of social media artist Steven Paul Judd, who works with pre-existing photographs and objects or kitsch images to talk about colonization. The artists emphasized that there are many aspects to the idea of colonization here, including colonization of culture and also of the media, and how sometimes natives’ children are more familiar with western figures than their native symbols and origins. 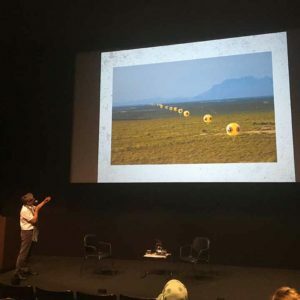 Abeyta also presented the works of the “Collective postcommodity”, where artists created a two-mile of “scare eye” balloon installation intersecting the U.S./Mexico border, opening the dialogue about indigenous cultural relationship to land, and the history of the interconnectedness of the land through secular migration, trade and cultural exchanges amongst different communities. Lastly, Abeyta shared some of his own production of paintings and murals that make a clear connection with the political climate today. Dark Carnival, as he explained, appear to be a very sweet and appealing work at first glance, but on a closer look, it reveals a darker side to it. Abeyta reflects that Native American art today is unprecedented. Its ironic and powerful aspects stimulate a missing dialogue, that, as Gould reminded us as well, can bring back the sacred spirit that has been neglected, or at least bring to light some of those hidden histories.